Citing established power supply infrastructure, transparent policies, and geographic convenience as pulling factor, China's Comtec Solar Group decided to choose Sarawak as its international expansion target. In 2010, Sabah had a rare opportunity of attracting RM5.2 billion in foreign direct investment from another China solar player, Sun Bear Solar Ltd, to set up the first solar glass manufacturing in Malaysia. This plant was supposed to be sited at Kota Kinabalu Industrial Park, but due to power supply shortage the plan did not materialised. It is apparent that, unlike Sarawak, we do not have an 'established infrastructure' yet. 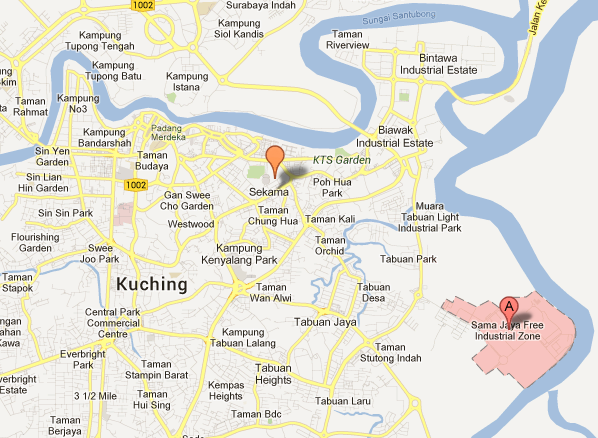 Sama Jaya Industrial Zone was developed by Sarawak government to encourage the siting of electronic industries. Comtec solar plant will be sited here. China-based Comtec Solar Group (Comtec) via its subsidiary Comtec Solar International (M) Sdn Bhd has formally officiated the ground breaking for its RM1.2 billion solar wafer manufacturing plant yesterday which will eventually have an annual production capacity of one gigawatt of N-type mono solar wafer. Having acquired approximately 40 acres of land in Sama Jaya Industrial Park, this makes the Sama Jaya plant one of the biggest mono solar wafer manifacturing facilities in the world upon completion. With the development of Comtec’s solar plant capable of supplying energy at reasonable a price, it is hoped that it could create the link between Samalaju and Sama Jaya. Explaining on the plant’s construction, Comtec chairman John Zhang said, “Our phase 1 construction will start by the end of June and is expected to be completed before the end of 2013 by Sinohydro. To note, the Comtec Group is one of the world’s top leading professional solar silicon ingots and N type wafer manufacturer, with a non-disruptive technology that dramatically delivers superior performance than normal P-type mono and multi wafers in current worldwide solar market. “Before we decided to choose Sarawak, we reviewed a number of location options worldwide,” Zhang told reporters. “After an extensive evaluation of established infrastructure, transparent policies, ethical practices, production cost, greographic conveninence and encouraging investments, we finally chose Samalaju in November last year." “We were impressed with Kuching’s well-established solar manufacturing base, experienced workforce and its attractive power supply infrastructure facilities,” said Zhang.